Take your outdoor entertaining from quite lovely to simply fabulous with these smart ideas and take full advantage of the beautiful summer months. Summer holidays are a truly wonderful time in South Africa. Spectacular mornings evolve into lazy afternoons, and then transform into warm evenings. It is a time to take full advantage of this “Champagne weather”, pop open that bottle of well-chilled bubbly and entertain al fresco. Consider how you would normally run an evening of entertaining. First off, allow for a reception area - somewhere your guests can settle down and enjoy an aperitif. An outdoor lounge area is an ideal space, as it is not too formal and allows everyone to settle themselves comfortably, or mingle as they please. Our Cape Cane collection will create the perfect oasis for your guests. Dining over the festive period should always have a flourish of luxury, and your outdoor dining area should be no exception. Pick a spot in the garden or on your patio that offers the best views and turn it into an al fresco dining space to remember. Small details such as hurricane lamps wreathed in a little greenery, candles, and baubles (available in store) scattered across the table, or even hung above it, turn an ordinary setting into an extraordinary one. The Refectory Table from the Designed by Sibley range, comes in a wide variety of colour options and finishes and is the perfect center piece for a covered outdoor patio area. Opt for comfortable dining chairs for a long, leisurely lunch with family and friends. Let the children choose a good spot in the garden, then lay down a rug, place the coffee table on top and add a few bright scatter cushions as seats. Get them to decorate their own table for a personal touch. 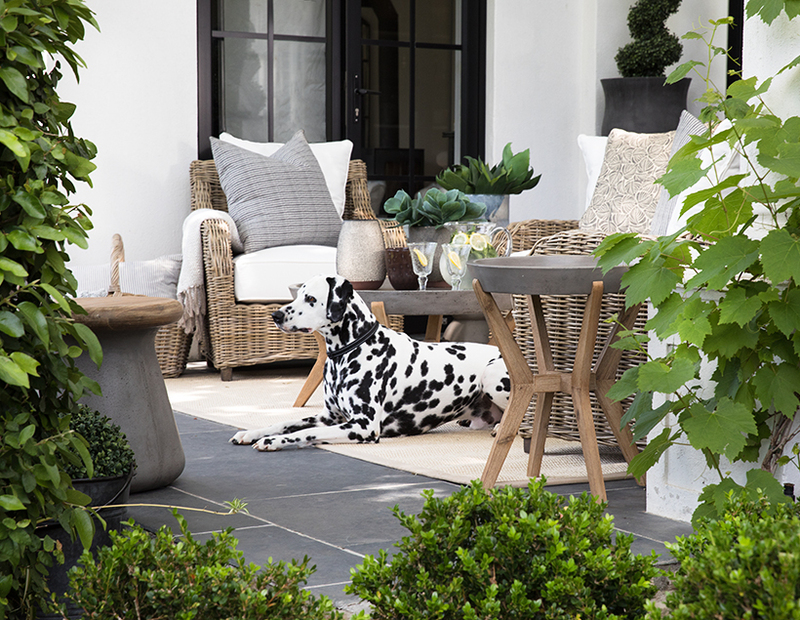 For after meal musing or simply for a space to spend time taking in the beautiful surroundings, give your guests the option of taking a leisurely stroll in the garden by adding a variety of garden accessories to those outdoor nooks: zinc planters, fairy lights, an outdoor bench and perhaps a hurricane lamp or two to light the way. Once the feasting is over, it’s time to recline on easier seats - your outdoor lounge area. At this point, it may be necessary to offer your guests a throw to place over shoulders as you enjoy your digestif. Block & Chisel stock a wide range of classic throws (available in store). Best of all is they are made right here in South Africa. These outdoor spaces offer a complete and easy way to entertain beautifully over the summer holidays.